Apple® and Donate Life America are bringing the donor registration process to your fingertips. 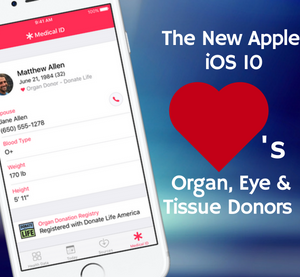 iOS 10, the biggest release ever of the world’s most advanced mobile operating system, is available today, September 13, 2016. iOS 10 allows iPhone users to register their decision to be an organ, eye and tissue donor directly in the Medical ID tab within the iPhone Health app. Through a simple sign up process, iPhone users can learn more and take action with just a few taps. All registrations submitted from iPhone are sent privately and securely to the National Donate Life Registry managed by Donate Life America. The ability to quickly and easily become a nationally-registered donor will enable people to carry their decision with them wherever they go. Donor registration through the Medical ID tab of the Health app also provides the option to easily share your donation decision with family and friends via text, email, Facebook, or Twitter. Previous Previous post: How ‘Bout Them Apples? !